An aid to Marvelous Designer users who want to create clothing for the Project Evolution girl (available at CGBytes), and her list of included morphs. Each sloper is individually proportioned to each morph. 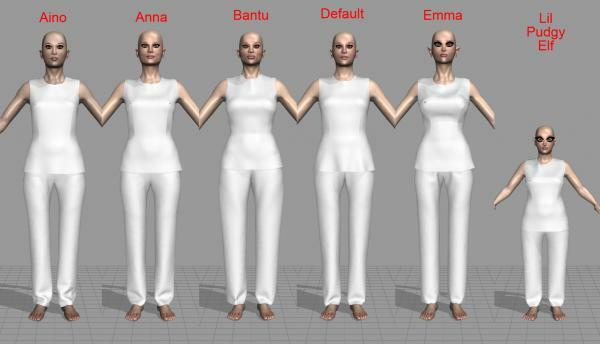 Morphs' slopers are included for "Aino, Anna, Bantu, Default, Emma, Lil Pudgy Elf, Lucia, Night Elf, Nordic, Regular Girl, Samaira, Smexy layday, and Yamato "
These slopers, or pattern blocks, are for a torso garment, such as a shirt or dress, and for pants, are close-fitting without being tightly stretched over the figure. This means that garments developed from the slopers will fit properly, but have enought room between the garment and the PE figure, for movement in dynamic clothing simulations. MD users are free to cut/slash/alter these patterns in any way to create their own designs. jbloves3d (4 months ago) Inappropriate? FVerbaas (9 months ago) Inappropriate?